In one side there are many researches going on to identify the cause of fibromyalgia and in the other side people are using various techniques to get a good relief from the fibromyalgia pain. Some of these methods are reported to be very effective for them. It is also dependent on how much dedication that a person shows in improving their health conditions. One day or the other their efforts will be rewarded and positive lights will be shown on them. It is very important to boost self-confidence with such thoughts. Among the various techniques used in treating fibromyalgia problems, pool based aquatic aerobic exercise program has become very common and popular these days. For the betterment and wellbeing of fibromyalgia patients, there are many places where aerobic and aquatic exercises are conducted. Many studies were conducted to understand the aspects of exercises on fibromyalgia patients. As an outcome of the research, it was identified that isometric and stretching exercises were very helpful in treating fibromyalgia patients. These exercises can be carried out both in a gym or can be done as home based exercise. It is important to seek advice from a physical expert to carry out the exercises in the right way. 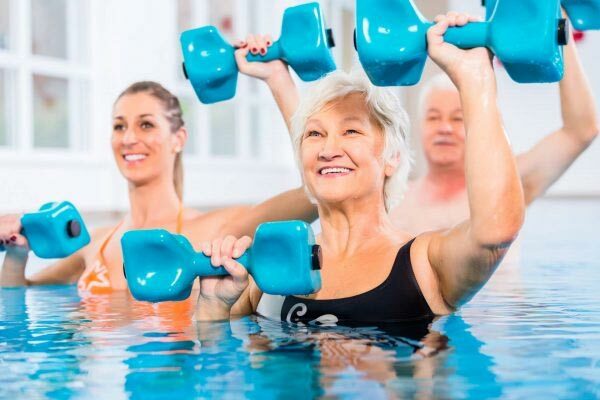 In order to understand how aquatic aerobic exercises work on fibromyalgia patients, a research was conducted with the help of 33 women patients who suffered from fibromyalgia. This program was conducted for 12 weeks to understand the effect of warm water aquatic exercise program over fibromyalgia pain. Visual Analogue Scale was used to assess the pain symptoms. At the end of the session considerable reduction in pain symptoms were identified and that too for people who had intense pain, improvements were evident. This research was conducted on female patients and the study showed that pool- based aquatic aerobic exercise helped in reducing the pain symptoms in female fibromyalgia patients. Some people also focus on doing land based exercises. That can also be helpful but there are other significances while doing a pool based aquatic aerobic exercise. The usual symptoms of fibromyalgia patients can vary from one patients to that of another patient. There are wide range of options available to suppress the pain symptoms of fibromyalgia patients. It is a case where one particular method might work for someone and another method for a different person. Most of the fibromyalgia patients experiment what works for them with the help of their doctors and use that particular method to reduce the pain symptoms and live normal life. In other words we can also say that it is a bit complicated to treat fibromyalgia patients. The topics and treatments suggested for fibromyalgia patients are highly controversial due to the above mentioned reasons. As an outcome of the study made on female fibromyalgia patients, it was identified that some of the common symptoms like pain, fatigue, sleeplessness, muscle stiffness were handled easily as part of pool-based aquatic exercises. From the experiences of fibromyalgia patients, we can see that there are multiple symptoms even a single person can develop if they have fibromyalgia. Some of these symptoms may even prevent them from doing their day to day activities. Remedies are available to treat each and every symptom. Proven medications are also available to suppress the pain symptoms of fibromyalgia. Natural methods may not be very comfortable for everyone. But those who are already doing land based exercises can try out pool based aquatic aerobic exercises to feel the difference and see if that gives a better outcome than what they are already doing. Researches show that old age women are getting good benefit from pool based aquatic aerobic exercise. The effect of this pool based aquatic aerobic exercise may not be evident after just a single session. It may take several sessions to see good results and considerable reduction in pain symptoms. From various researches it is quite evident that physical activity is very important for fibromyalgia patients. Fibromyalgia patients usually associate themselves on muscle activities. When comparing to that of normal people, fibromyalgia patients when they do physical activity they do it with greater pain and fatigue in their body. If we take this as a topic for discussion there are also other controversies after comparing the before and after effect of such physical activities. For those who find this helpful continue to do physical activities regularly. It is also believed that pool based physical activity and hydrotherapies are also very helpful in handing fibromyalgia widespread pain. Hydrotherapy is carried out with the help of additional exercise or without any exercise. The water buoyancy is highly responsible for providing this relief to the fibromyalgia patients. If the water is kept warm during the therapy or exercise, it is an added advantage. Buoyancy and warm temperature of water helps in reducing fibromyalgia pain. Regular exercises either land based or water based exercises can help fibromyalgia patients get good mobility on their muscles. Fatigue and pain symptoms are suppressed after regular exercise. For some patients it may not be evident after every session but on a long run it will be visible. Other symptoms of fibromyalgia such as hyperalgesia, allodynia, sleeplessness, muscle cramps are also relieved from regular exercises. Compared to that of land based exercises, when warm water is used in a pool to do pool based aerobic exercises, it has shown better results as warm water by nature has healing properties. Decrease in level of fibromyalgia pain on female patients. There are some set of exercises carried out as part of pool based aquatic aerobic exercise. This includes walking inside water exercise, stretching exercise muscular movements, relaxation exercises etc. From the outcome of the researches we can see that they strongly recommend fibromyalgia patients to take part in pool based aquatic aerobic exercise sessions to experience the difference and get benefited. Fibromyalgia: Is It Declared a Disease in The USA? I fully support water aerobics for anyone dealing with body pain. Being in the pool takes away the impact of the ground. There is no pounding on the knees, back, or hips. Water aerobics for people living with fibromyalgia is a solid choice. Even if you can’t swim, you can still participate because most of it is done in the shallow end. I highly recommend taking water aerobics to ease pain and get your body moving again. I enjoy gentle lap swimming & doing my past PT exercises in a warm pool followed by hot tub jets pounding my trigger points…works for me over the past 3 yrs. I really stiffen up & pain is worse when I miss more than a week.